Cloud outage problems should be a thing of the past. If you've been playing Grand Theft Auto Online then you know there have been some cloud save issues, often resulting in your vehicles - or their expensive modifications - vanishing like a thief in the night. Those days are done, says Rockstar, thanks to the latest PS3 and Xbox 360 patch. Measures have been taken to prevent users from losing progress when there's a cloud outage, from losing cash when there are network problems, and even from a rare bug that caused people to lose vehicles and modifications after exiting the game. Are you still waiting for your cash stimulus? You need to be patient, as Rockstar still isn't convinced it's all quiet on the GTA front. However your patience only needs to last for a couple more days, because as soon as the Title Update settles things down the spice will ... um, the cash will flow. 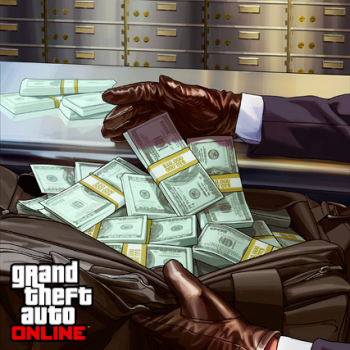 "The Stimulus will go out over the course of a full day once it's initiated," says Rockstar, "so don't be alarmed if people on your friends list receive it before or later than you do." Bugs and server problems have plagued this title since its October launch. Maybe now we can settle down and enjoy the online crime paradise Rockstar promised lo, those many moons ago, when this thing was first unveiled. Update: The stimulus is rolling out now, Rockstar confirms. "We expect that it will take up to 2 full days for the Stimulus Package to be fully delivered to the entire player base from October 2013, so please be patient if you do not see it appearing in your in-game bank account just yet."